This DIY Upcycled Terra Cotta Bird Bath is For the Birds! In case you haven’t noticed, I am a big fan of upcycling anything that I possibly can. 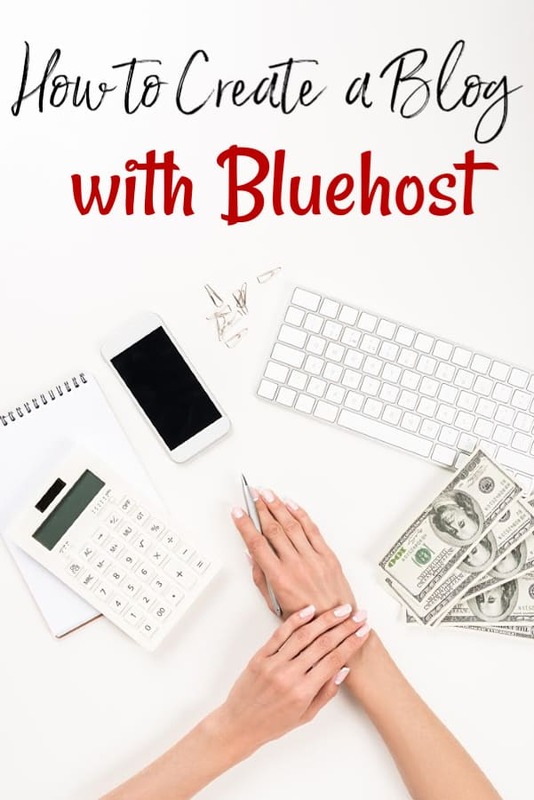 They can save so much money in your personal budget, plus, I get a kick out of finding a new use for something that someone else might simply see as trash. For me, upcycling has become a game. I have found ways to upcycle towels, ways to upcycle old sheets, ways to upcycle milk jugs, new ways to use fabric softener, ways to upcycle empty bottles and even ways to use clean kitty litter (aside from the obvious of course)! It’s a game for my family to see how many new uses we can glean out of something! 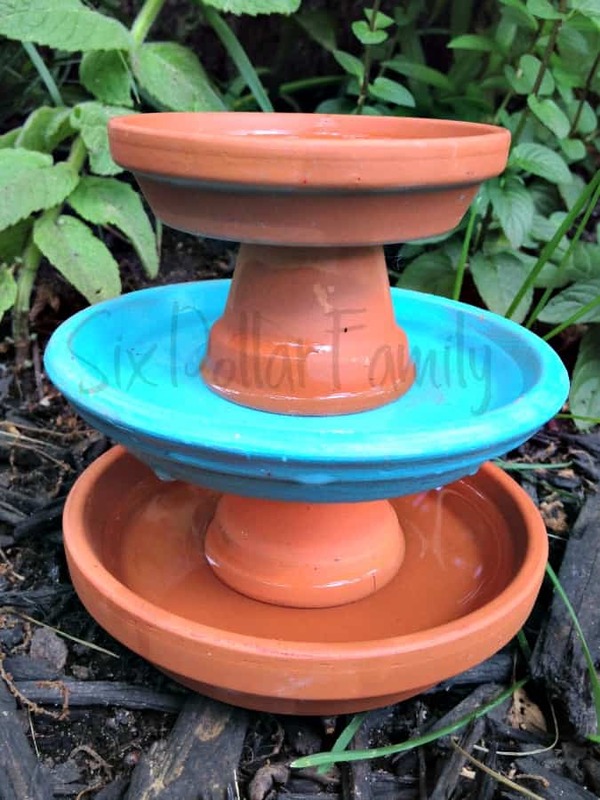 This upcycled terra cotta bird bath is only one of the ideas that I am absolutely in love with for those that are looking for ways to upcycle terra cotta pots. 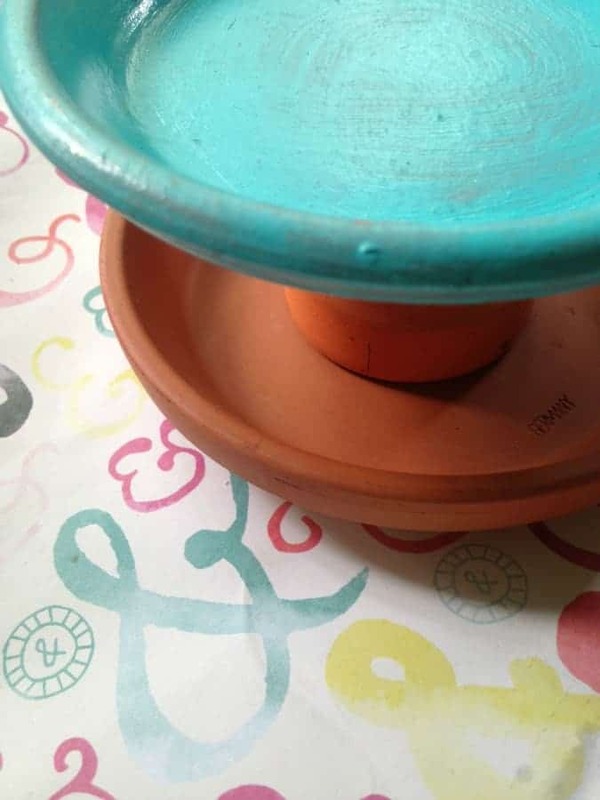 What I really love about this upcycled terra cotta bird bath is that it can be made to accompany any home or garden color theme. 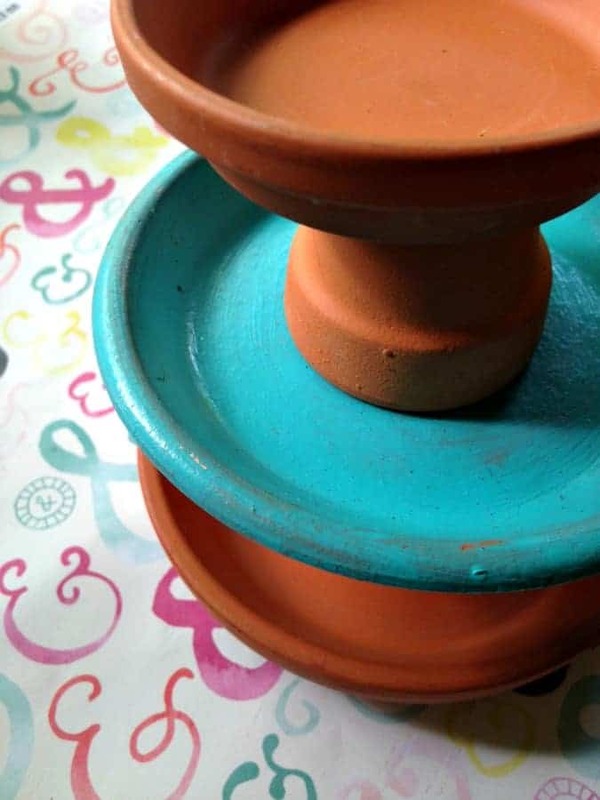 You can paint the pots any color that you want, in any order that you need or you can leave them the terra cotta color for a true upcycled feel. We only did a three layer bird bath, but you could easily do a 4th layer if you had a smaller pot to nest inside of the top one. It really is up to you to personalize this upcycled bird bath the way that you want to! It really is a great way to reuse something to save money! This is one of my favorite upcycled garden projects that I have come across. It goes especially well with my DIY upcycled milk jug bird feeder! The birds can eat a meal, get a drink and take a bath all without ever leaving your yard!I love terra cotta pot crafts such as my DIY Chalkboard Planter, DIY Stars and Stripes Patriotic Flower Pot or my DIY Ombre Flower Pot and this one will fit right in! Plus, this one is so easy to make that it’s perfect for the kids to help! To start, you’ll need to clean your terra cotta pieces very well. Use warm and soapy water to scrub well then rinse well and let them air dry completely. It may not seem important, but it is and will help remove any debris making it safe for the birds to drink from them. When I’m washing something that animals may eat or drink out of, I use Original Blue Dawn. It’s the gentlest on them that you can buy. You’ll also want to take the time to paint each one if you’re doing so. Just be sure to give the pieces that you’re painting a couple of coats and allow them to fully dry before you move onto putting your bird bath together . Once your pieces are cleaned, painted and have tried, it’s time to start piecing it together. Lay the largest terra cotta saucer flat on your work surface. 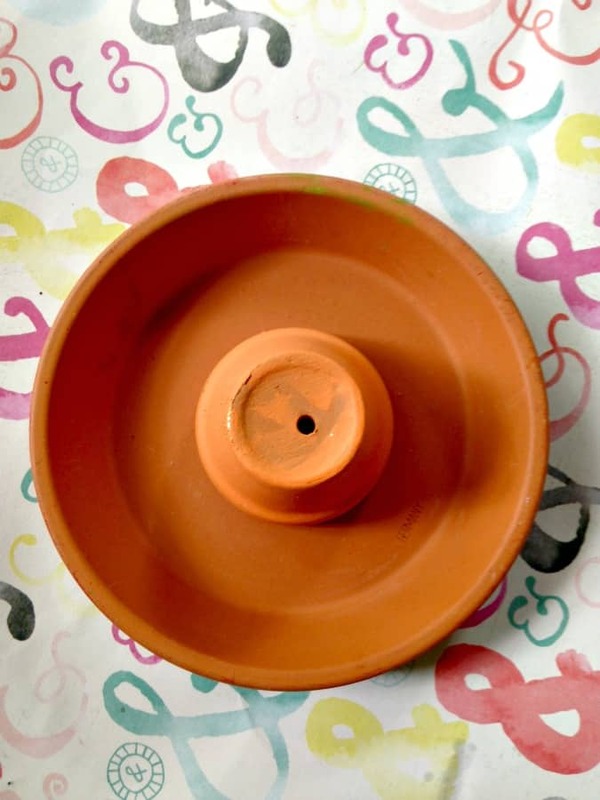 Apply a thin line of Gorilla glue to the rim of one of the flower pots and place it upside down in the center of the saucer like shown in the photo. Press down firmly so that it adheres to the saucer. Set it aside and allow it to dry fully before moving onto the next step. 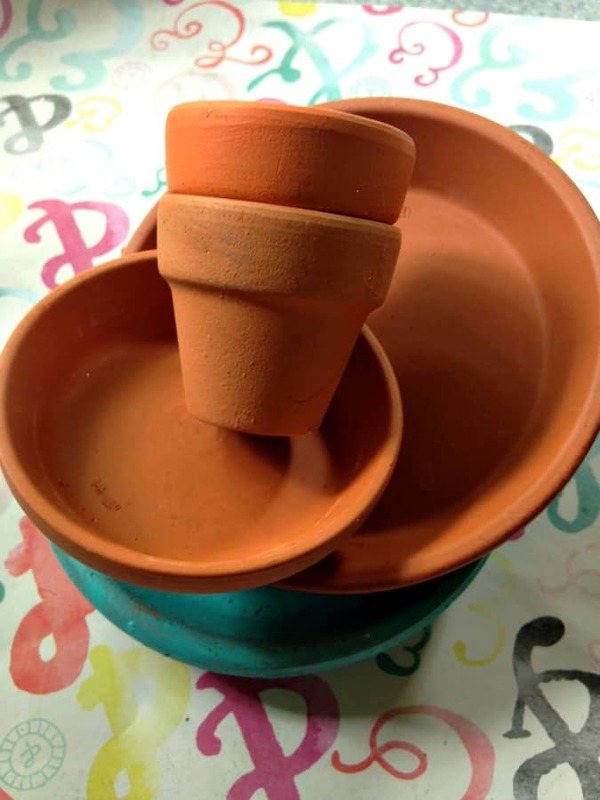 Once the glue on the first layer has fully dried and you’ve made sure it’s steady, stack another terra cotta saucer on top of the flower pot you just put in place. Make sure to center it well and let dry. Once it’s partially dry, continue stacking by adding another small flower pot in the center of the saucer. Allow it to fully dry before moving on. Once it’s all dry, add the final top saucer using the glue. Press down firmly to make sure you get a good seal. Allow the top layer to dry fully before moving it. Once the entire thing is dried and steady, go on and move it into your garden or yard. 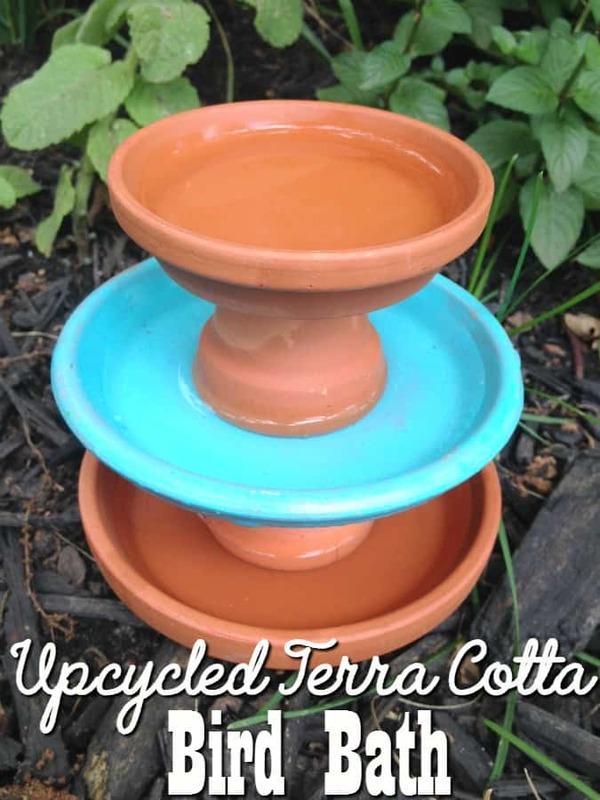 Your new upcycled terra cotta bird bath looks great wherever it is! Add a layer or two of water, add a layer of bird seed or fill the whole thing with water. Either way, the birds will love you for it! Is there some kind sealer or paint I can use that won’t be harmful to the birds. You could just leave it unsealed although I’m not sure how well the terra cotta would hold up without being sealed.